Knowing how to read your meter can be helpful if you want to check for leaks in your system or if you’re concerned about a recent bill. 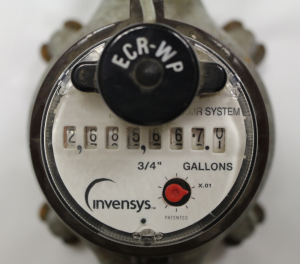 Your water meter tracks how much water comes into your home from your service line and displays this usage as a cumulative number. Your monthly bill is based on the difference between the last two meter readings. We receive readings from your meter via a radio unit connected to your meter. This “MXU” radio transmitter is commonly installed outside your house in a tan plastic box. If this transmitter malfunctions, you will receive an estimated bill. Contact Customer Service at 888-510-0606 to schedule an appointment if you receive an Estimated Bill. 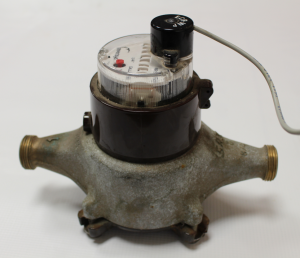 An example of a typical water meter. The meter is connected to your water lines on either side of the meter. Most water meters are located in the basement near where your water line enters through the wall (often the front of your building). The photo to the right shows an example of a typical water meter installed in our service area. Newer meters are white and black with a plastic exterior. If your basement is not well insulated or if you have broken windows, your water meter may freeze and break during the winter. You can read our tips here to prevent frozen lines and water meters during the winter. The face of a typical water meter found in homes in our service area. Newer meters have a digital display. Your water meter will have a dial or a digital reading showing the total cumulative amount of water going past the meter. Some meters have fixed zeros on the right hand side. This number is the basis of our billing but the MXU radio transmitter only communicates the meter reading to the nearest 1000 gallons which is what you will see on your bill. Your most recent bill reflects the previous month’s water consumption so your meter will not match. If you have any questions or concerns about your meter reading, give Customer Service a call at 888-510-0606. Stop water usage. Don’t run any water inside or outside your home. Locate your water meter (see above). Read your water meter. If the dial is moving, you have a leak somewhere in your house. If the dial is not moving, Congrats! You don’t have a leak in your plumbing. If you still have a question about a recent increase in your bill, please refer to these Billing FAQs, give us a call at 888-510-0606 or send us an email at info@capitalregionwater.com. Learn how you can identify the source of your water leaks with EPA’s Water Sense Program.